Considered to be the north/south dividing line between Europe and Asia, the Caucasus Mountains are home to Mt. Elbrus, a lovely 18,586ft/5,665m glaciated twin summit. Elbrus lies just three miles north of the Caucasus mountain divide, making it the highest mountain in Europe. 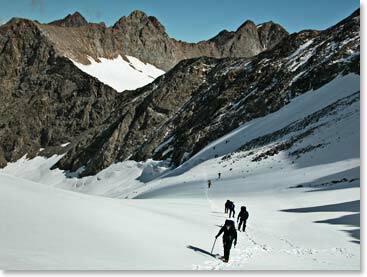 Join the Berg Adventures 2010 Expedition team as we attempt to reach the summit of Mt. Elbrus. This trip is a favourite of Berg Adventures, not only for the fantastic mountaineering experience but also because of the rich history and cultu	re of the Russian people which we will experience during our stays in St. Petersburg, Moscow, and the Caucasus region. July 1, 2010 – Berg Adventures Team Reached the Top of Europe! June 26, 2010 – Clear Skies, A Great Hike and Some Shopping!